This is a pretty steep trail, and the first section of it is among the most challenging. Warming up after a long drive is always a little rough, and when you combine that with an opening stretch that climbs about 2000 feet over two and a half miles you have a recipe for some discomfort. The good news is that the trail starts off in a splendid forest of pine and cedar trees, and the rapid ascent quickly yields some beautiful views to the west. On this visit, a sea of clouds blanketed Los Angeles and transformed the mountain range into its own island in the sky. Across the valley, Mount Baldy was visible through the haze as a neighboring island. This type of view is not uncommon in LA’s mountain ranges, but it consistently brings solace no matter how many times I’ve seen it. Open views like that are relatively few and far between though on this trail. The forest here is vibrant and thick, which is a nice change of pace in SoCal but not very conducive to sweeping panoramas. When those views do pop up they can be amazingly expansive, and each one acts as a great reward for your effort up the steep slope. After about 3 miles, the trail reaches a junction with the PCT. This is roughly the halfway point for the hike. From the junction, the route up the mountain follows the PCT for close to a mile up the hill. Here the trail begins to traverse onto the northern slope of the mountain. Some pockets of snow began to show up around the trail, but nothing of any concern. This section can hold a significant amount of snow through the spring in a wet year, but the 2013-2014 winter was anything but that. Open views on this stretch of the PCT are nonexistent, so you take what you can get. I counted two solid water sources on my hike up the mountain, though I wasn’t paying that much attention since I had opted to carry what I needed. There was fresh clean water flowing out of the snow at Deer Springs Creek on the PCT, which I expect will dry up very soon. At the next junction, the PCT heads down Fuller Ridge and the route up Marion hangs a right up the hill on the Deer Springs Trail. The forest suddenly vanishes here, replaced by hillside of short shrubs that help open up some of the best views of the hike. As the trail ascends the hill, the San Gorgonio Wilderness begins to become visible over the ridge to the north in a spectacular view. The main downside to this section is that the shrubs flanking the trail are quite sharp and at times encroach onto the trail enough to easily scrape up your legs. Pants are nice to have during this stretch. Soon enough the trail returns to the trees and trades the open landscape views with intimate forest scenes. As the trail approaches Little Round Valley, it begins to flatten out and the views of the surrounding area begin to become more obscured by the nearby landscape. Fortunately, the trail quickly begins ascending out of Little Round Valley up the final hill to the summit area. Marion Mountain begins to come into clear view from the southern side of the trail. Despite the first part of this route being called the Marion Mountain trail, there is no official established trail to that summit. As the trail plateaus for the last time, it intersects with the rest of the other paths that reach the summit of San Jacinto, and chances are that any sense of solitude that you previously had will be gone. This is a pretty popular summit. The final stretch is a short scramble over a few boulders. There is no “right” way to take here, but some routes will be a bit more difficult than others. The view from San Jacinto is pretty spectacular, you can see in all directions for miles, and the view out to the desert seems to stretch for an eternity. It’s a little difficult to photograph though, mainly due to the throngs of hikers who sit on top of or in front of any possible foreground element that you could include in your shot. I prefer to enjoy my views and breaks with some solitude in places like this, so I usually don’t linger on summits like this. Before long, I was heading back down the mountain enjoying amazing views from the trail that I had all to myself. The afternoon sun trickling in through the trees made each twist and turn feel like a new revelation. The scattered patterns of light on the rich textures of the forest floor gave each scene a remarkable depth. As far as LA hikes go, this is as good as it gets. Thanks! It’s always a pleasure. One of my favorite hikes when we vacation in Palm Springs each June! I will have to try out your route some time soon. As always, I enjoyed your trail write up and the great pictures! Thanks Dale. Looking forward to seeing your take on the trail when you get to it. Great post. Have you hiked any of the other trails to the peak of San Jacinto? 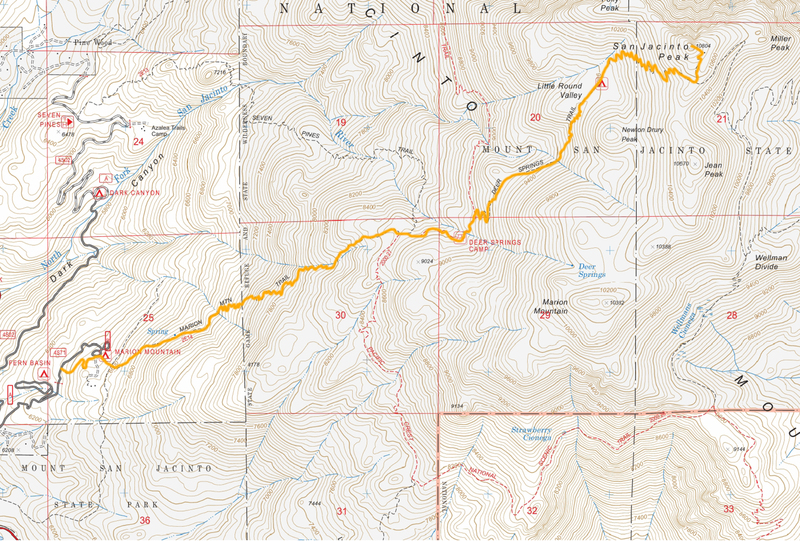 I plan to go backpacking there and was curious about the various hikes to the peak. Merv, I have not. I am planning on doing a few more of them soon though. The main concern is always whether or not you’ll be able to find water where you camp, which can vary a lot from year to year and throughout the seasons. I can’t comment with much authority on that yet. Hopefully soon though. Great blog, write up and photos!!! I’ve gotten some great ideas on where to hike with my pup! Quick question- your photos are great and I’m wondering what settings and/or filters you lean towards with most of your outdoor shots. I always have such trouble with scenes that have a lot of shade and sunshine. You have nailed those shots! Thanks Nick. No special filters or techniques really. Having been taking shots like this for awhile, I’ve gotten better at recognizing when the light will work in my favor, and for post processing I will balance the exposure in Adobe Lightroom but don’t do much beyond that to achieve the effect you are talking about. Great blog, best source of information I have found so far (too bad I went yesterday!) I was told it would take 7 hours at the ranger station and several hikers, but it took me 3.5 just to get to the Little Round Valley. As it was already past 4PM, I had to turn back. I had met 3 groups all together, 3 cars all together in the parking lot! The trail is so poorly marked that, with the snow still covering the uppper half, there are parts where I had to search for it by following footsteps, sometimes going in loops, as they got lost too. You would think that the main trail to SoCal’s most prominent mountain would be maintained better. Yeah, it is surprising how remote it can feel back there. I think that is because the majority of people summit the mountain from the other side via the Tram Station. Thanks for reading Gabor. Gabor, I made a summit attempt the weekend before your attempt and although there was a lot of snow on the trail, I was able to summit and make it back to the trailhead by 2p. If it was already past 4p when you got to Little Round Valley, and had taken 3.5 hours to do so, that means you didn’t hit the trailhead until after 12p. Much too late for a trail you hadn’t ever tried before. I’m glad you made it back safely because the result could’ve involved a long, cold night on the mountain. I can assure you that this trail is very easy to follow when it is free of snow. It is one of the best in SoCal. Give it another try.